Indeed. This is how it usually pans out when Pearl comes upstairs for a sleep. She’s so old now that we welcome her in the bed and allow her to sleep — wherever. Lately she’s been sleeping more and eating less. I looked at her on Sunday and she seemed smaller than ever and her spine is pronounced when I stroke her back. Her eyes become runny sometimes and I wipe them clean and try to keep her as comfortable as I possibly can. My heart is heavy when I look at her and I feel as though she and I are having a long goodbye. I suppose, philosophically, we are all doing the same. But she is very near the end of her sweet life and so my feelings of loss are close to the surface. Marley is Shadow’s opposite in so many ways, but he has captured our affection. Give Pearl a cuddle for me. I’ve gone through the same thing too many times. Give Pearl as much attention as you have time for, and don’t let her suffer. 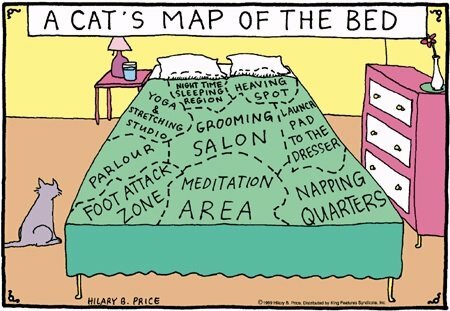 I love that cat map. My poor Fat Kitty had only a sliver of the bed thanks to the two dogs. I miss her. Thank you Kate and Alan. Anyone who’s been through this understands the sadness. It makes me feel that I can bear this. Yes , a hard time, but something we must face. I know you will do right by Pearl (and Pumpkin), but it’s never easy. That map, on the other hand, is a tonic! Wait il I show this to The Man-he’ll laugh. My heart is heavy for you. I like your take that we are all doing the long goodbye. Love to Pearl.